There are around 30 state historic sites in Texas, operated either by Texas Parks and Wildlife or the Texas Historical Commission, but few are as evocative as Fort Leaton, constructed in 1848 as a center for trading with the local Comanche and Apache tribes. The square-shaped fort occupies about one acre of remote desert land near Presidio in the far west, and has an impressive, sturdy construction, with adobe walls up to three feet thick, fortified windows and doorways, lookout towers and a large central courtyard. Besides the commercial activities at the fort, which flourished due its strategic position on the Chihuahua Trail between Santa Fe and Mexico, the complex was also used as a base for passing military expeditions, though soldiers were never permanently stationed here; the first official army garrison in this part of west Texas was Fort Davis, opened in 1854. Fort Leaton was built by pioneer farmer Ben Leaton, supposedly on the site of an old Spanish mission, and at its peak contained over 100 rooms. Leaton died just 3 years later, after which management passed to his wife and later the Burgess family who stayed here until the 1920s after which the site lay abandoned until acquired by the State of Texas in 1967. Although very close to the gradually expanding border town of Presidio, Fort Leaton remains a little way beyond the eastern suburbs, so retains its lonely, atmospheric setting. The complex lies on the south side of FM 170, the River Road, next to the edge of the Rio Grande flood plain, and bordered to the north by desert land of low hills and dry washes. Today, the fort also acts as the western gateway to Big Bend Ranch State Park, which begins 5.5 miles east. 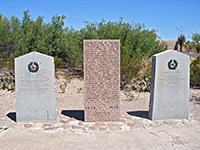 Outside Fort Leaton are three memorials, one for Ben Leaton himself, the others for two previous structures thought to occupy this site - the old Spanish mission of Apostal Santiago, established in 1683, and Presidio del Norte de la Junta, built around 1759. The interior of Fort Leaton has a mix of ruined areas and restored rooms, with many historical exhibits. Guided tours are provided, or visitors can explore the site unaccompanied; other facilities include a half mile trail around the fort grounds, and a shaded picnic area. The day use park is open all year except Christmas day, between 8 am and 4.30 pm.